Gillian Flynn’s best-selling thriller Gone Girl was a literary sensation and was destined for the big screen. Flynn herself was given the task of streamlining the novel into a 150min screenplay, and with films like Se7en, Fight Club, The Social Network and Zodiac proving him to be a brilliantly methodical director and a master of misdirection, David Fincher was just the director to manage the various major twists and turns that Flynn’s story throws at us. On the day of their fifth wedding anniversary, Nick Dunne arrives home to find his wife Amy missing. The police are called in but something doesn’t seem quite right. The kidnapping investigation soon becomes a murder investigation, and with an intensifying media circus that brings with it revelations big and small about their relationship, Nick finds himself the prime suspect. Gone Girl looks at the role the media plays in turning investigations into sensations. We see the ease with which public perception is manipulated by the media, how little details and tangential titbits can be put under the spotlight and made to look incredibly significant. It is Nick’s inability to appropriately play the media game that causes him to look suspicious, and the court of public opinion judges accordingly. Ben Affleck is perfect casting in this regard. As we watch Nick being hounded by the press, and we see him breaking under the pressure of constantly being scrutinised and judged, knowing that Affleck has lived that experience adds to the character. Gone Girl starts on the morning of Amy’s disappearance and follows the investigation from there, but we get flashbacks of their relationship narrated to us through excerpts from Amy’s diary. As such we experience Nick in an objective present, but Amy in a subjective past. What we see and know of Amy is determined by what she has written in her diary, and as the film progresses the reliability of her narration comes into question. Unlike a traditional thriller, Gone Girl gives us its game changing reveal quite early. Barely halfway through the film we learn the truth about Amy’s disappearance. That revelation changes the focus of the film. For the audience, the investigation is no longer about working out what happened to Amy, but about revealing who Nick and Amy really are. 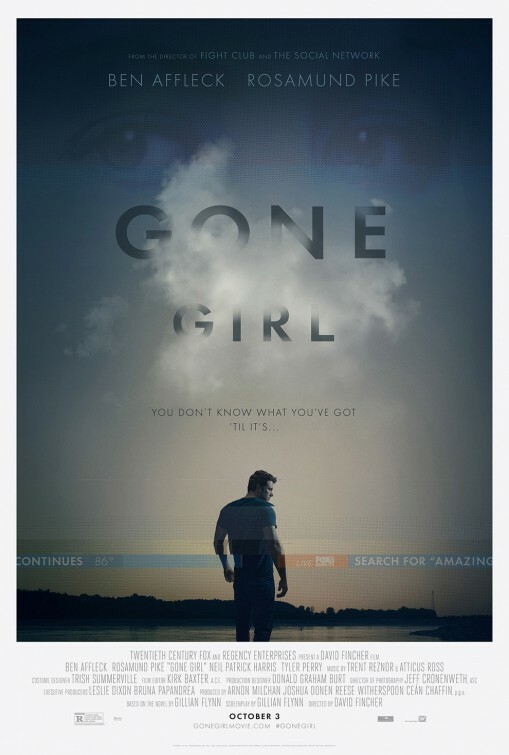 More than just a mystery thriller, Gone Girl is a film about human relationships, and quite a cynical one at that. The film explores the place of narcissism in marriage, examining the way in which people play roles during courtship, pretending to be the person they want their partner to think that they are, or the person they think their partner wants them to be, and then how relationships break down and resentment builds when partners grow tired of playing those roles. Through its hyperbole it asks how well one can really know their partner when both are simply playing roles. As good as Affleck is, it is British actress Rosamund Pike for whom this movie is a real breakout. Pike’s look perfectly suits Amy; the privileged, trust fund kid. We believe her intelligence, and we also believe her insecurity. After all, her trust fund is the result of a successful series of children’s books her mother wrote in which the lead character, Amazing Amy, lives out an idealised version of her own life. But there is also something mysterious and unreadable about Pike and as we start to discover more about her character she shows us something new and the film really becomes hers. Gone Girl is an extremely interesting and engaging film, but it is not without its problems. Tonally it will cause some viewers difficulty. What starts out as a pretty straight drama gradually morphs into a tragicomedy, a perverse satire, without ever openly embracing a satirical tone. There are moments in the film that are quite brutal and others that are obviously being played for laughs. It is a very fine tonal balance that the Fincher is trying to strike, and he is not always completely successful in achieving it. Similarly, after an engrossing first and second act, the third act falls flat. Rather than building to a crescendo, Gone Girl reaches its peak at the end of the second act and then gently burns out. With a two-and-a-half hour runtime, it is in this third act that the film starts to feel long. Gone Girl is the kind of smart, insightful, middle-budget (around $50 million) film which is few and far between in Hollywood these days. Well performed and expertly directed it is a peculiar and engrossing piece of filmmaking. Have you seen Gone Girl? Leave a comment and let us know what you thought.